Chapter 1- Keith’s first assignment as a Catholic priest was at St. Mary’s Church in Stockton, CA where he served as assistant pastor and county jail chaplain. He was a supporter of the Civil Rights Movement and Farm Workers Movement. He was also a leader in the Cursillo Movement in California, Oregon and Nevada. Later on, he taught theology at the Graduate Theological Union in Berkeley. He took great interest in the progressive theologians of that time and began questioning his vocation. He had also fallen in love with Nancy Wagner of Stockton and decided to get married in 1971. Chapter 2- Keith and Nancy moved to San Diego where Keith was accepted into the Master’s program at San Diego State University to become a Vocational Rehabilitation Counselor. He completed the degree in 1973 and was immediately hired by the State of California, Bakersfield District. He served the blind and disabled clients in three counties for eleven years. The couple bought their first home and enjoyed their years there. But the coast was calling. Chapter 3-Keith took early retirement in 1984 and a move to Santa Barbara took place. He and Nancy purchased a home on the Westside (before the prices got too high). Keith kept busy in retirement. He converted the garage into a woodworking shop where he designed and made many pieces of furniture for their home and for others. He was a volunteer teacher of woodworking at Braille Institute for 20 years. He also volunteered at the Community Kitchen for many years. The couple enjoyed traveling in the U.S., Mexico, Canada, Europe and the Orient. They enjoyed worshiping with St. Anthony’s Community and Keith was called on to serve the Community as a married priest for the past sixteen years. He continued reading and studying the progressive religious writers and theologians to expand his spiritual growth. He was a wisdom elder, sharing his knowledge with others as spiritual advisor and counselor. 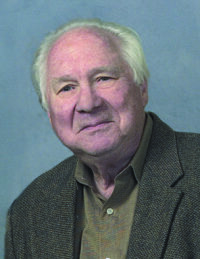 He was a member of the Steering Committee for the Word and Life group for many years. Keith was known for his kindness, compassion and wonderful sense of humor. He will be missed by many. Keith is survived by his loving wife, Nancy; his brother, Robert Forster (Sue); his sister, Marylin Nielsen. He was a devoted uncle and great-uncle to many nieces and nephews. A Celebration of Keith’s Life and Memorial Mass will take place on Sunday, January 13, at 9:30a.m. at St. Anthony’s Chapel, 2300 Garden Street, Santa Barbara. Memorial gifts may be made to: Eyeshine, P.O. Box 117, Goleta, CA 93116 (eyeshine.org) or Sarah House, P.O. Box 20031, Santa Barbara, CA 93120.